Our Foodies’ Favourite Food Tour takes you down the cobbled stoned streets of Copenhagen and into the heart of the Danish kitchen. Within the last decade the nordic cuisine has become famous all over the world with the concept New Nordic. With this concept one must cook after the season, with raw materials from the North and create a tastefull and healthy dish. On the tour you will e.g. 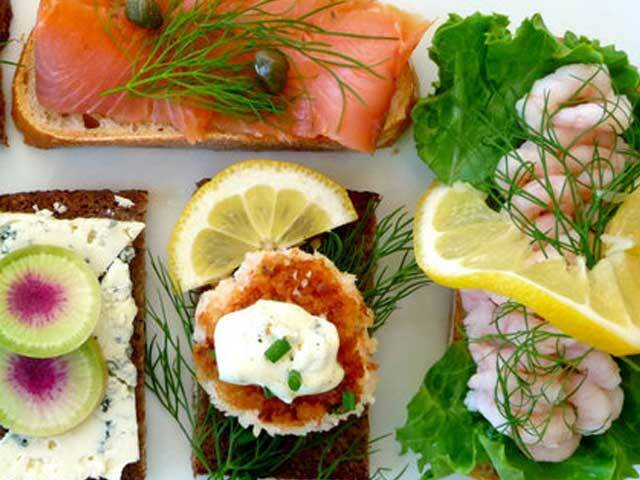 taste the traditional Danish lunch: an open faced sandwich called ‘smørrebrød’, which is a piece of ryebread with different kinds of topping on it. Try for instance the marinated herring or a Danish liver pate with pickled beets and bacon, just to name two on the endless list. We will also tell you all the stories about the Danish beer and snaps with a visit to a local brewery. Afterwards, we will give you samples of sweets like salty liquorice, Danish pastry and the indescribably good “flødeboller” (basically it’s a crispy little waffle with whipped egg whites and sugar covered with dark chocolate.) Along with the sweets you will try beverages like elderflower or buckthorn. Price: 699 DKK / 110 $ / 94 € . per person participating. There is a minimum of 8 people needed to book this tour. Contact us if you are fewer people or have any requests regarding the tastings. Optional: We can also organize cooking classes for bigger groups. We will considerate food allergies or religious food restrictions. Please inform us when you book the tour.